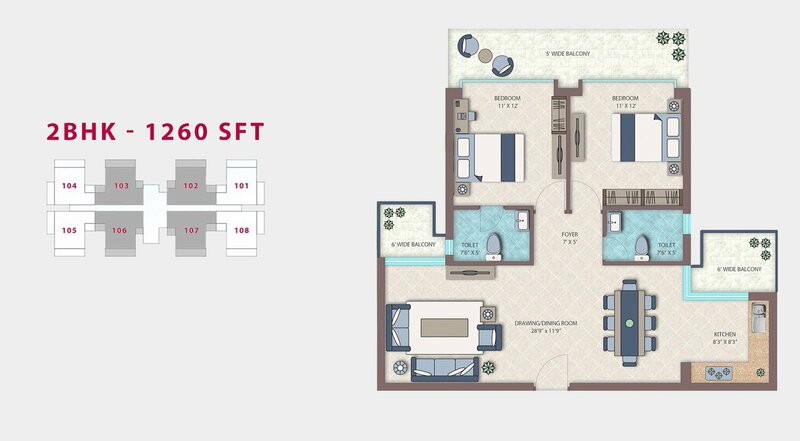 Area Range: 1260 to 1310 Sq.Ft. Floor Number Unit No. Type 1 - 1260 Sqft. Type 2 - 1310 Sqft. Prices mentioned above may be revised at the sole discretion of Company. Prices prevailing on the respective date of Booking shall only be applicable. After acceptance of offer/Booking settled prices shall be firm and escalation free. Stamp Duty & other charges for registration of units shall be borne by the Allottees. Any additional facility, requested by the Allottee shall be charged extra. Interest Free Maintainance Security (IFMS) shall be payable @Rs.50/- Per sft at the time of Possession. Electricity Meter, Dual Meter and Connection Charges as applicable will be charged axtra. Proportionate Charges as per carpet area of unit for getting Bulk supply electric connection from Power House/ Power Grid/ Sub-station till Project Site will be charged extra which includes fee and security amount payable to DHBVN or any other cometent Authority, expenses incurred on Poles & Cable to bring power connection/ line to project site, installation of transformers within the project, Sub-station sharing cost of HVPN, HT Meter Room with Equipments & HT Panel Room with Equipments Etc. Minimum Power Backup of 2KVA is included in Flat Value.Additional Power Back up (Maximum upto 5KVA per flat) can be provided subject to additional payment of Rs. 30,000/- per KVA. One mandatory Covered Parking is included in Flat Value. Additional car parking (open/covered)will be available on request on "First Come First Serve" basis on additional cost. Parking on Basement/Stilt will be allotted on "First Come First Serve" basis. The above mentioned area is super area /saleable area which include covered area plus proportionate share of common area such as staircases, passage, lift facilities etc. Covered area means Carpet area and area under walls, balconies etc. In other words, whole are under the outer lines of a flat is covered area. All facilities shown in publicity material, building plans, layouts, specification etc. are tentaive and subject to variation and modification as deceided by the company or Competent Authority. Price, terms & conditions stated herein are merely with a view to acquaint the applicant and are not exhaustive. Allotment of unit will be governed by terms and conditions to be signed by the Applicant/Allottee as contained in Application Form and Buyer`s Agreement. Construction of Project will be completed within 15 Months (Approx.) in case of High rise building and delay beyond such period will be subjected to penalty clause as per Buyer`s Agreement. Cheques to be made in favour of "Emerald Homedevelopers Pvt. Ltd." (or as intimated by the Company from time to time), payable at Delhi/Faridabad only. Outstation Cheques shall not be accepted. Transfer Charges as applicable from time to time as per policy of the company. Allotment of units will be done on "First Come First Serve" basis. Flat Value includes EDC/IDC, but Enhanced EDC will be charged extra subject to final outcome of CWP pending in P & H High Court on Actual Basis. All Statutory taxes such as VAT, Service Tax, GST etc. shall be charged extra and any other charges levied by Central/State Government as applicable shall be charged extra. Personal Lawn/Green Area or any other additional terrace area beyond balcony area provided will be subject to payment of additional charges. 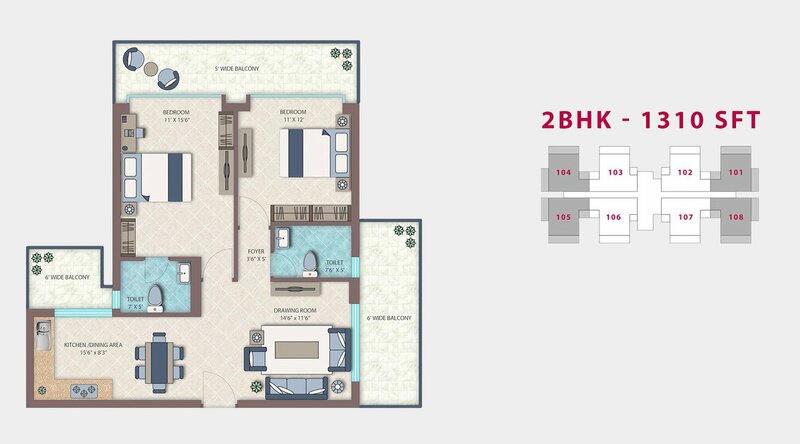 Flat Value includes facilities of One Covered Parking, One Club Membership, EEC, FFC and 2KVA Power Backup. 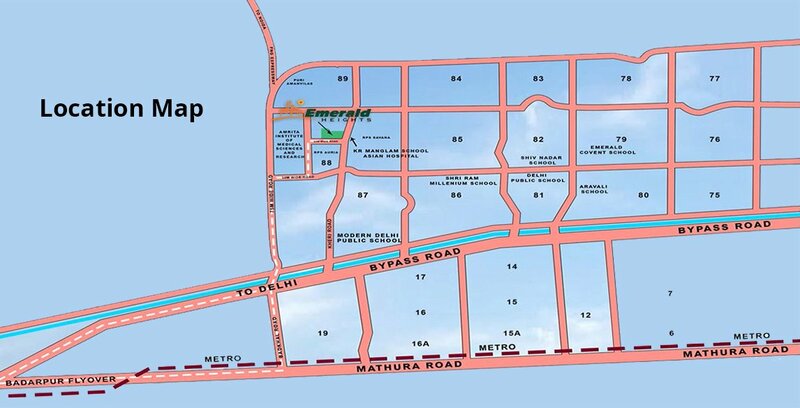 Payment Plans for "Emerald floors"
Flat Value includes facilities of One Open Car Parking, One Club Membership, Current EDC & IDC . Enhanced EDC & IDC (if any) will be charged extra subject to final outcome of CWP pending in P & H High Court on Actual Basis. 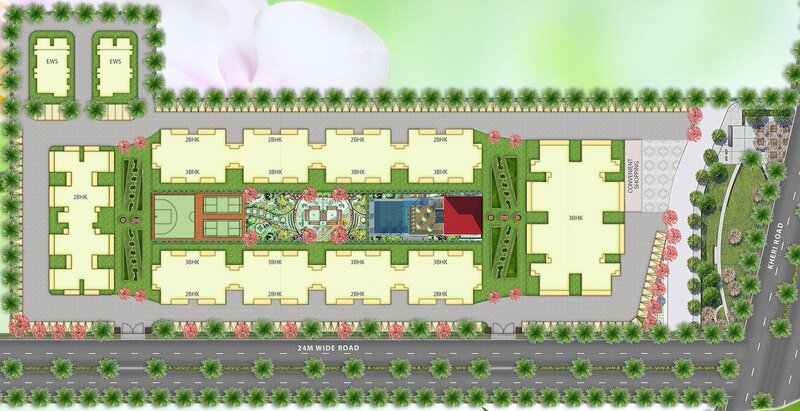 Flat value includes facilities of Power Back -up - 2KVA for 2BHK & 3KVA for 3BHK respectively. Additional Power Backup facility can be availed @Rs.30,000/-per KVA. Interest Free Maintainance Security (IFMS) shall be payable @Rs.50/- per sqft at the time of possession. Cheques to be made in favour of "Emerald Homedevelopers Pvt. Ltd. Escrow" (or as intimated by the Company from time to time), payable at Delhi/Faridabad only. Outstation Cheques shall not be accepted. All Statutory taxes such as GST shall be charged extra and any other charges levied by Central/State Government as applicable shall be charged extra from time to time. Personal Lawn/Green Area /any other additional terrace area provided will be subject to payment of additional charges. Wall/Ceiling Finishes: Ceramic Wall tiles up to dado level (approx. 2100 mm), above it OBD. Sanitary Ware: Wash Basin, EWC with Cisterns, CP Fittings, Provision for Hot & Cold Water System. Wall/Ceiling Finishes: Ceramic Tiles up to 2 feet height above counter and plastered and painted with pleasing shades of OBD. Platform: Pre polished Baroda Green marble or equivalent marble or Indian Stone. CP Fitting/Fixtures: Stainless Steel Sink, CP fittings. Provision for Hot & Cold Water System, provision for Geyser. BALCONIES Flooring: Vitrified / Ceramic Tiles. Wall/Ceiling Finishes: Exterior grade paint on plaster. Handrail and Parapets: Combination of Parapet. Walls and M.S. handrails as per functional and elevation requirements. EXTERIOR WALL External Wall Finishes: External grade anti fungal/anti algae paint from reputed makes and brands. STAIRCASE Flooring: Polished Indian Stone/Indian Marble on trends, raisers and landings. Railing: Polished/Painted M.S. Handrails and Balustrades. Wall Finishes: Oil Bound Distemper on Plaster. COMMON PASSAGE Flooring: Polished Indian Stone / Indian Marble / Tiles. Wall/Ceiling Finishes: Whitewash/ Oil Distemper on plaster. DOORS/WINDOWS Main Entrance Door: Painted/ Polished hardwood frame with polished / paint flush door shutters. Internal Entrance Door: Painted/ Polished Hardwood Frame with painted flush doors. Hardware: Locks. handles/knobs. MS/Steel/Brass hardware. Windows and External Glazing: Aluminum frame or UPVC frame windows with clear glass or equivalent. ELECTRICAL PLUMBING Fixtures and Fitting: ISI compliant modular switches / sockets, distribution boxes and circuit breakes from standard makes and brands. Wiring: ISI compliant copper wiring in concealed conduits. Adequate provisions for light points, fan points. receptacles and power points in all rooms. Electrical points for Exhaust Fans in Kitchens and Toilets. Plumbing: ISI compliant GI/CPVC/PPR water supply pipes with standard valves and accessories. ISI compliant PVC Waste Pipes and Traps or equivalent. NO CHANGE IN COMMITTED SIZE OF FLAT. ALL APPROVALS BY CONCERNED AUTHORITIES FOR CONSTRUCTION. Copyright © 2017 emeraldheightsfaridabad.com. All rights reserved.